Although hair strands are considered "dead", I like to treat mine as though they were alive. After all, they play such a big role in my life and I would be devastated to lose them! I do different things that will help keep my strands attached to my head, so I can enjoy them for as long as I can. I find that my hair loves natural remedies, since I have yet to have any side effects from using them. Since I went natural in 2008, my hair has bounced back from all of the harsh treatments I have put it through. Thankfully, my strands have been the utmost forgiving and decided to give me a second chance. Today, I have long tail-bone length curly hair and I have my natural regimen to thank for that. One of my favorite remedies to use for my hair (and skin) consist of clays. I love them all, but I have certain ones that I prefer over others, especially when it comes to my hair. The three clays that I adore are highly beneficial for your scalp and hair. 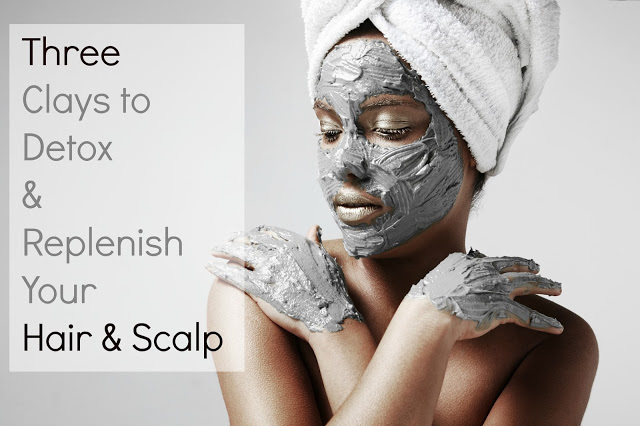 Other than detoxing your hair of chemicals and pollutants, kaolin clay is an excellent choice for dry, brittle hair. Whether your hair is in this condition because of your tap water, chemical processing or continued use of chemical hair products, you can use this to help restore the moisture. Of course, I do recommend that you fix these issues to get the best results. One of my fave -- Moroccan clay, aka Rhassoul clay. This one is packed with minerals and has high absorption for impurities found in your hair. It can also help to relieve dryness, flakes in your scalp, and assist with detangling your hair. I like to use this clay because it leaves my hair soft. It reminds me of a conditioner. Of course, I can't leave out bentonite clay, which is one of the best clays for detoxification. I find that mixing Rhassoul with it helps to minimize the hardening effects that bentonite can sometimes have on hair. After you've collected these three clays, putting them together and mixing it up is quite simple. Just make sure that you use a non-metallic bowl and spoon when doing so. How much you use for your hair depends on how much hair you have. Combine equal parts of each clay into the bowl and use filtered or distilled water to mix it into a creamy paste.